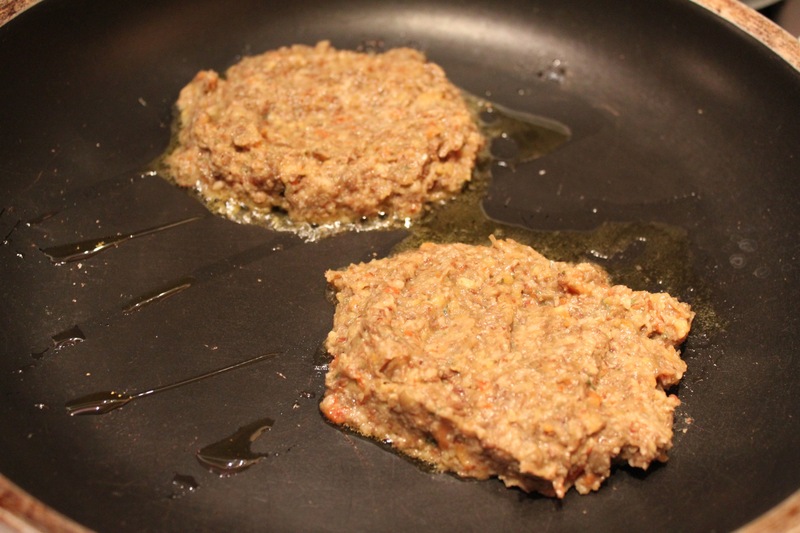 I keep saying I’m going to make some kind of homemade veggie burger and I’m not sure why I never got around to it…until today! I meant for them to be black bean burgers, but somehow forgot the one thing I went to the store for (please tell me you’ve done that before). I was pretty sure I had some at home, but… I didn’t. Luckily, I found a bag of lentils in my pantry. I glanced at a couple of random recipes, but really just threw together my own concoction. After a little trial and error with the cooking times, I think they both looked and tasted good. I think I’ll keep trying new additions (more veggies!) and different beans, but both my squeeze and I liked it, so I guess that’s all that counts. I made the mistake of saying, “It was easy!” — now it seems this might be a weekly request… (but it really was easy, so that’s OK). I decided if I made the mixture sans egg replacer/flax mixture, you could make it a day or two ahead of time and add that at the last minute before frying. Again, this isn’t scientific, but it worked so here’s what I did. 1. If you don’t have a container of bread crumbs (like me), I started by tossing 3 slices of bread (I was hurrying, or I think I would have toasted it first) into a food processor. It made 1 1/2 c. of crumbs and I ended up using a little over one cup. Set aside after processing (I chose a 2 c. measuring cup so I could see what I was working with). 2. I then processed the red pepper, small onion, garlic, salt and pepper until it was a liquidy mush. I may have added some fresh parsley at this point too. I took THAT out and set aside in the bowl that I would mix the whole thing in. 3. Prepare egg replacer or, in my case, whisk ground flax seed and water. It’s supposed to be 1 Tbsp. ground flax seed and 3 Tbsp. water per egg (I was planning on three), but I ended up adding an extra Tbsp. of flax when it wasn’t thickening up enough (perhaps I was just being impatient). So, it ended up being 4 Tbsp. ground flax seed and 9 Tbsp. water. I whisked, let it sit for a bit, then whisked some more and was happy. It was kind of sticky and goopy — seemed like an egg to me! 4. I processed 3 c. cooked lentils (prepare about 8 oz. according to the package directions) with the egg mixture. About 2/3 of the mixture was pureed and the rest were still mostly whole lentils, which is what I had envisioned, so that worked for me. 5. Mix into pepper/onion/garlic mixture, then add bread crumbs until it’s as thick as you want it. I did this until it was like a thick, sticky hummus consistency. Spice accordingly (here’s where I’d add some hot sauce if you like it spicy). 6. Heat skillet over medium heat and add a couple of tablespoons of olive oil. After much trial and error, I found that if you take a scoop of the batter and spread out to burger size, cover and cook over medium heat (or just under medium) for about 7 minutes, flip, then cook the other side for 4-5 minutes until browned to your likeness. I was pretty happy for this first attempt and will definitely be trying this — likely with some variations — very soon! Entry filed under: Beans & Lentils, Main Dish, Recipes, Uncategorized. 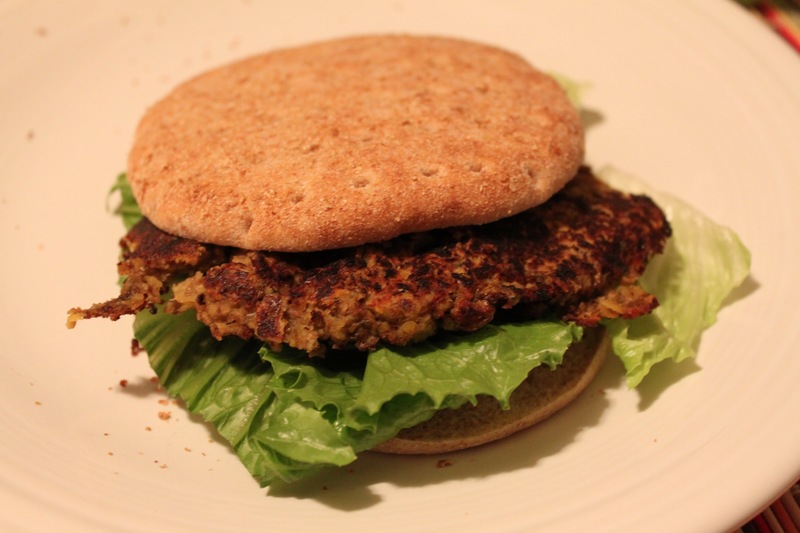 Tags: bean burger, burger, comfort food, lentil burger, vegan, vegetarian, veggie burger.